To add SENA capability to a second helmet. Needed to move my communicator between helmets without moving the mount. I have a new Shoei Neotec modular and I need to move my Sena over to it as my primary helmet. I wanted to change my Sena SMH10 from a boom mike to a wired mike for my new full face helmet. Bought a different helmet and needed a new clamp. Specifically for my new Aria Defiant Pro-Cruise helmet. I wanted a mount for my coms that didn't have a boom mic. This rig works very well. Already have an SMH-10, need a clamp for a second helmet. Ordered from you b/c free shipping with the tire I also ordered. Works great on my extra helmet. Now I can just use the already paired SMH-10 Unit and move it to different helmets. Wanted two helmets ready to ride with Sena SMH10. Needed for 2nd helmet used on adventure bike. I have the SENA System on my other helmet and didn't want to change to another system. The clamp kit allows me to mount it to my other helmets so I do not need to purchase another bluetooth unit. I can just attach my current sena SMH10 to any helmet which I have. Good investment if you have multiple helmets and don't wanna spend lots of money on multiple bluetooth. I wanted to be able to quickly swap my intercom unit between helmets. I have two helmets, 3/4 and full. I use both depending on the weather and the drive and wanted an easy way to use my Sena SMH-10 between the them. Based on my experience with the SMH10 and the reviews of others on this product, it was perfect for my needs. Reading the reviews, it appears this is the best option to be able to move the SMH 10 from helmet to helmet. I purchased this helmet clamp kit so I could switch helmets with communication quickly. It worked great. To have on my second helmet. I have a street bike that I ride with a Bell Qualifier DLX helmet and a super moto I ride with a SS2500 that this kit will attach to so I can swap my SMH10 to it when I switch bikes. Needed this for my other helmet. Saves from having to buy a whole new set-up. The clamp kit will allow me to switch the Sena SMH-10 unit from one helmet to the next with ease. Just the thing if you have an SMH10 and more than one helmet. I just recently purchased a Sena 20S so I'm going to install my current SMH10 on my girl's helmet and this clamp kit on one of my other helmet so that I can use the unit on whichever helmet I choose to wear. Great for people that ride two completely different bikes, i.e. on sportbike and one touring/cruiser. I have a full face for the sportbike and a modular helmet for the cruiser. Have a spare helmet that I wanted to be able to use my Sena on. Bought a new Schuberth C3 helmet and the original boom mike setup just doesn't work as well as I would like it. Found a video on installing a Sena on a C3 and they went with this exact set for their helmet. Like all Sena products, these are excellent. Easy to install. Great sound quality. Very happy in my purchase. Needed to mount to my shuberth C3. Works very well. Make sure you use 3M adhesion promotor with the sticky mount. I have a Summer & Winter helmet and did not want to switch mounting kit every 6-months. So I can switch between full and 3/4 face helmets. Purchased this kit to expand my SMH-10 to my second helmet. I have the clamp kit with the fixed boom and with my Nolan 91 it is a bit tight with the mic next to my mouth. I wanted to try the wired mic and attached it to the inside of my chin piece on my modular helmet. The perfect solution to not having to purchase the entire kit over again! The Sena is great another best thing I have ever bought for all my bikes. Will this work with the 10s ? BEST ANSWER: Worked for me!!!! Is this used as a walkie talkie too? Can you talk to another rider with one without calling and using minutes? Yes, you can. You only use minuets if some one is call thru your phone. This device main stay is communicating ride to ride like a walkie talkie. The new ones can communicate to multiple Sena's at one time. The range is very good, I have experienced a range of about 3/4 of a mile even in corners. It can be paired with multiple units and you can talk back and forth. It does not use your phone for this feature. It is line of sight though and you can lose the connection if you get too far apart. Still a great unit though, would definitely recommend it to anyone. This is only an accessory kit for the main SMH-10 unit. If you're asking about the SMH-10, then yes you can talk directly to your passenger or another rider.- no phone needed. But this product on it's own will not do anything. The Sena is designed primarily as a bike to bike communication tool, therefore, yes you can talk to other riders. You can also connect to your phone and your GPS via Bluetooth and use them as well. It is a great unit. Yes, that is how it works as soon as the other rider also has a Sena device. On such cases you don't need to call him using your mobile, but only the Sena communicator. Yes. 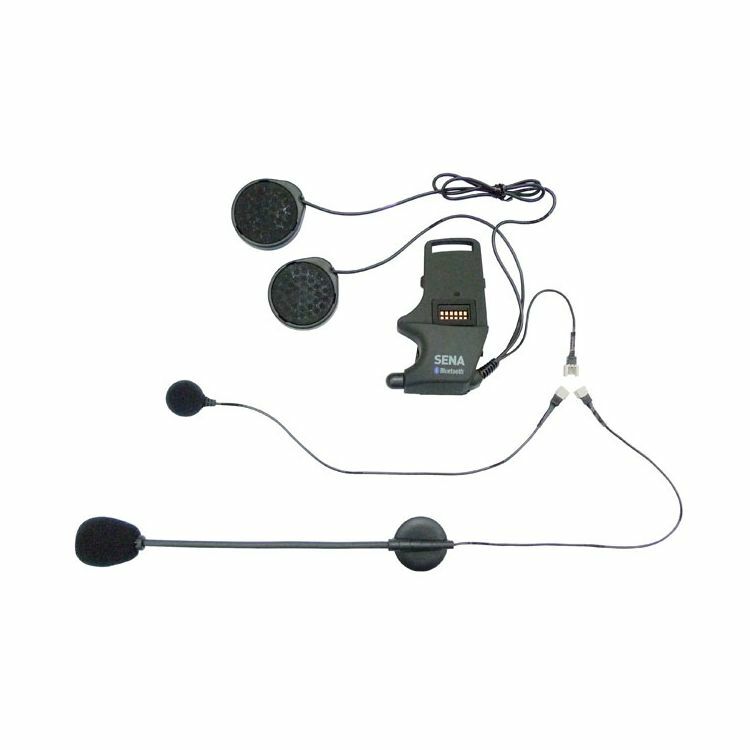 The SMH-10 has an "intercom" feature compatible with other SMH-10's. Up to 4 riders can share an intercom session. Max. range is approx. 0.5 mile. Will this work with the Sena SM10 Stereo Bluetooth Transmitter? I am told that I need the optional clamp kit SMH-A0302 that allows you to mount the SMH10 clamp further back on the helmet to use it on helmet. But I can't find this code. Is this the one? BEST ANSWER: The Sena SMH-10 comes with this particular clamp to mount the unit on the side of the helmet. This accessory, or an extra clamp could be used to outfit multiple helmets to be used with a single device. I have a Scorpion EXO-900. Would this system fit my helmet? And does this come with everything I need to install? BEST ANSWER: I don't own any Scorpion helmets so I'm not sure if it will fit. My wife and I have 6 different brands & styles of helmets, including open face, modular, & closed face, all of which have the smh-10 installed with no problems. We simply Change the main module depending on temperature/season /length of ride we are doing. This is the main reason I bought this system since you can purchase the mic/speakers separately, for about 30 dollars & install in several helmets. Then just snap in the main module in which ever helmet you decide to wear that day. Hope this info helps. Ride safe! i've used the SMH-10 on both a Scorpion 700, and ALSO a Shoei Multitec modular helmet and installation and use was excellent. you might want to call Revzilla just in case... But i'm quite sure it will work just fine. I have bought the Bell Mag 9 helmet and Sena dual SMH 10 headsets. I am getting a Shoei Neotec helmet and want to install the other unit in that, plus have the ability to move the Bell unit to my wifes helmet. How or what do I need in a clamping device to hold the Sena units to the new helmets? BEST ANSWER: I have used this clamp assembly on a Nolan Open Face, a Bell RS-1 Full Face, a older Nolan 102 Modular, and Two different G-Max Modular helmets. I did not need anything in addition to what was supplied in the Clamp Kit. I would recommend that you use the actual 2 piece clamp with the screws. I ride all summer in Florida and I don't trust the double edge sticky tape mount in the Hot Florida Sun. This should work fine for you, I ride with several friends that use this clamp on their Shoei Neotecs. I have moved the clamp from old helmets to new and I have extra clamps that I leave mounted to my current helmets so I can just move the SMH 10 unit to the helmet I want to wear that day. Hpe this helps. You should have all you need. Recently I moved my wife's Sena from an HJC to a Shoe Neotech after an adventure in the Swiss & Austrian ALPS. Just loosen the clasp with the hex wrench and re-install on the new helmet. You will have to determine the best path for the speaker wires but that's Q.E.D. (Quite Easily Done)! You will need to buy a clamp kit. The Shoei helmet if I recall correctly is a modular helmet so you would need to use the boom microphone. Personally I prefer the wired microphones since they are less bulky and visible but these can only be used with a full faced, non modular helmet. I had to use the adhesive backed mount on my wife's Neotec. The clamp would not work. Yes it comes with everything you need minus the Bluetooth device itself. It varies for the headphone speakers, for my helmet, ( AGV Horizon ) I have a slot for the speakers right by the ear so it worked out. My friend had to put his underneath the padding, no worries because the speakers are pretty loud even underneath the padding. I installed it on an exo1100 with no problems. Yes it comes with everything you need. I would like to buy this product to use with my iPhone 6. Can I connect this to my phone and use it as headphones and mic without buying additional components? BEST ANSWER: No. This is an additional clamp kit for the SMH-10. You need the SMH-10 to connect to your phone. This allows you to move the bluetooth piece between multiple helmets. no get the whole deal and use the bluetooth, that way you can control volume , selection and on and off without touching the phone. Otherwise just use your ear buds . No, you need the main module. There is a 3.5mm port but it's only for audio in. Would this clamp kit allow installing the Bell Mag9 SENA SMH-10 on any other helmet? BEST ANSWER: Yes. The kit comes w two versions of the clamp - one that uses adhesive and on that is a try clamp. The SENA clamp kit allows it to be used on a variety of helmets. I have it installed on a Shoei with the flip up mandible. I prefer the helmet speakers over ear phones and the Shoei has cut outs for speaker placement. You may want to check if the helmet you are considering is similar to the Shoei in this regard if you are leaning toward speakers. You can always check with SENA by phone as they have excellent customer service and may have input regarding helmet compatibility. Best of luck. The Sena clamp kit is quite versatile. I have used it on Shoei rx1100 and flip up as well as full face and flip up Schuberth helmets. I am a fan of this product. BEST ANSWER: Yes, but only for Audio if you use the headphone plug. You won't have control of the player other than to change volume up or down. You have these controls if you connect by bluetooth. If you connect by bluetooth, you can virtually control all aspects of an ipod/iphone/ipad/etc. I've used the cable when I had some BT difficulties, good, but no real control to skip/pause/etc. From Sena's product page: (see Stereo music by 3.5mm audio cable; supports above). Every Helmet Clamp kit that is offered specifically for the SMH-10 will have the auxiliary port that you can plug a MP3 player into using the coiled cable that is supplied with the SMH-10 kit. There is a MP3 Port on the unit. This unit is the same as the 301 except the mic is detached. yes the bracket that mounts to the helmet has a jack for an audio cable.